This 69-year-old man renders free service to public by helping them fill applications in SBI. 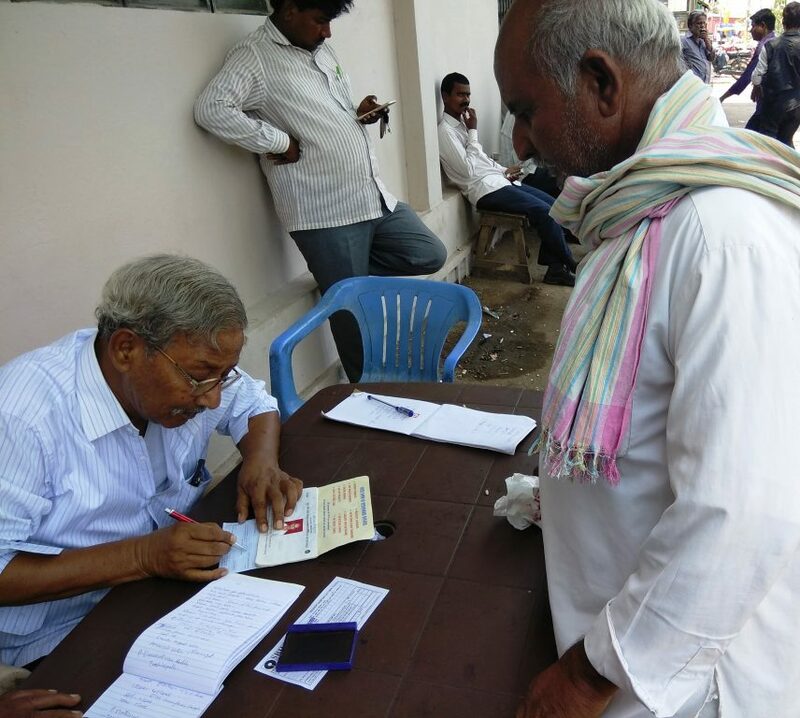 Sangareddy: A teacher, who retired as a high school headmaster a decade ago, has been rendering free services to customers visiting State Bank India (SBI) in Sadasivpet branch in Sangareddy district by helping the customers fill all kinds of applications. D Mallanna, 68, who was born and brought up at Sadasivpet, will serve at least 400 people visiting the SBI and other nearby banks located in the vicinity on each day, for which he charges nothing. The retired teacher has said that he used to visit the premises quite frequently in 2007 after his retirement for a chitchat with retired employees. One day, the bank management had offered him to work as facilitator in the bank for which he would be paid Rs 10 to Rs 20 for filling up each application of customers visiting the bank. As he already had thoughts of doing some free service to the people, Mallanna saw it as an opportunity and decided to discharge the duties without accepting anything in return. Interestingly, he will never take a leave on working days and stay at the bank during the working hours. He will get his lunch box and will have lunch during lunch hour only. Whenever he goes on leave during some unavoidable circumstances, Mallanna will surely ask one of his retired friends to discharge his duties to avoid any inconvenience to customers. However, one of his friends has said, Mallanna hardly takes one leave in a year. The regular visitors to the bank fondly call him Mallanna Sir. Recognising his services, the SBI AGM had arranged a permanent chair and table for him on the premises of the bank. Mallanna used to discharge his duties sitting on the steps of the bank until a year ago. “God had given me very good life and one of my children had settled down in the USA and one daughter and another son have been also been doing well in business in Sadasivpet town. I receive a good amount of pension every month,” he said. Mallanna has further said that neither his wife nor his children ever objected him from doing this service since his work has been evoking great respect in the society. Everyone in Sadasivpet and neighbouring villages identifies him and his family members and wishes them with great respect.